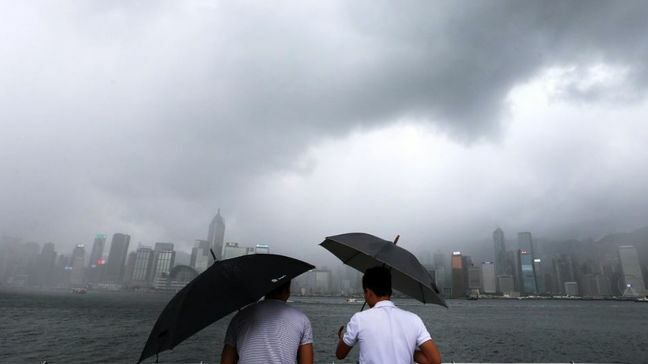 EghtesadOnline: Tropical Cyclone Pakhar made landfall in southern China after prompting Hong Kong to raise its storm Signal 8 alert for the second time in a week as the storm brought strong wind and heavy rain to the Chinese territory on Sunday. Tropical Cyclone Pakhar made land near Taishan City in southern Guangdong Province, the city’s weather observatory said in a statement issued at 9:45 a.m. local time Sunday. Earlier, winds reached storm force in the southwestern part of Hong Kong and hurricane force on high ground of Lantau Island, it said. The gales are expected to moderate progressively and the observatory will consider downgrading to Signal 3 before 2 p.m., according to the agency. The Airport Authority Hong Kong reported 140 flights had been canceled as of 6 a.m. Sunday, according to the government website. The Home Affairs Department opened 27 temporary shelters and 218 people had sought refuge there as of 9.10 am. The China Ferry Terminal in Tsim Sha Tsui had been closed temporarily, the government website said in an announcement issued at 9:05 a.m. According to the Hospital Authority, 17 people -- eight men and nine women aged between 24 and 83 -- sought medical treatment at public hospitals during the typhoon period. The storm is forecast to track a path similar to that of Hato, the Signal 10 tropical cyclone -- the highest on the observatory scale -- that battered the region on Wednesday. Hato killed at least eight people and injured 240 in the neighboring city of Macau and caused damage in southern China, the South China Morning Post reported on Saturday, adding that water supplies in some parts of the city famous for its casino industry remained disconnected. Hato on Wednesday caused at least 450 flights to be canceled or delayed in Hong Kong, and forced the closure of schools and trading at the stock exchange. Pakhar is looming in the western Pacific as Hurricane Harvey lashes southeast Texas.